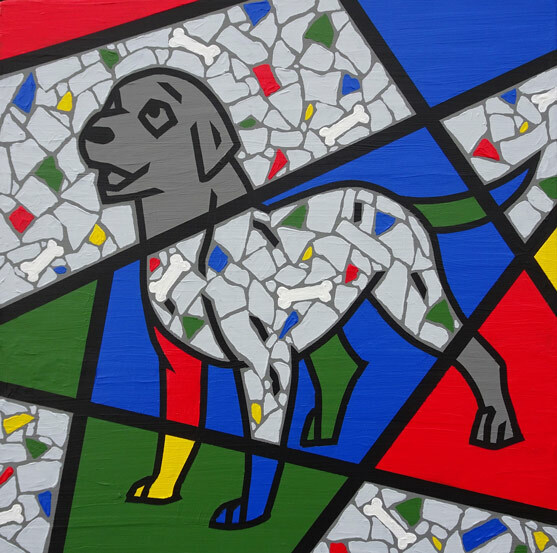 Eddie Bruckner is a professional artist who creates original acrylic abstract paintings, public art, and teaches personalized, in-home art lessons for adults and children. His paintings have been exhibited on Newbury Street including the Boston Architectural Center, as well as in art galleries around the country from New York City to Texas to New Hampshire to Providence, Rhode Island. Eddie Bruckner’s artwork has been selected for a number of prestigious juried art shows such as the Cambridge Art Association’s National Prize Show, and the Connecticut Academy of Fine Arts Annual Juried Exhibition. Most recently, Eddie Bruckner was commissioned by the City of Boston’s Public Art Commission to paint an electrical box near Fenway Park and a second Electrical Box along the Boston Marathon Route in Natick, MA. His artwork is about having fun, bringing a smile to people’s faces, and at the same time, providing a unique way of experiencing some of our most familiar objects, places, or people. 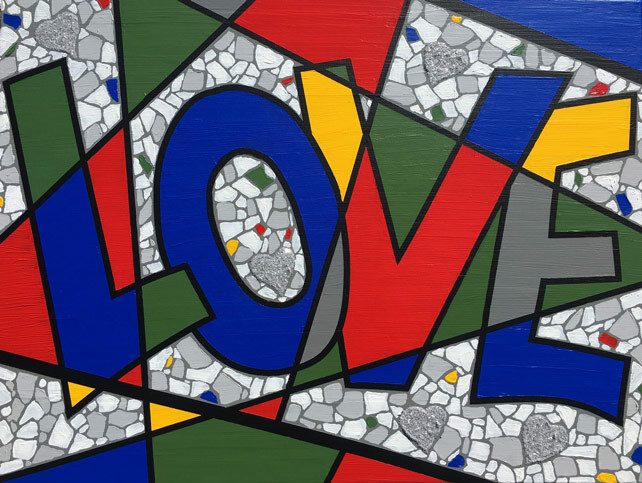 His work focuses on vibrant colors, bold lines, and the integration of an illusion of mosaic tile as a visual language of happiness, love, and the beautification of physical space. For more information, please visit www.EddieBruckner.com. I am a professional artist and I paint original acrylic abstract artwork typically on canvas and sometimes on board. My artwork has an element of pop art and abstract expressionism in them. 90% of the time, my paintings are conceptualized in my head. I might do a rough sketch of what I had envisioned and either make changes, determine colors or the placement of lines, etc. Then I pick up the paintbrush. The other 10% of the time, my ideas are generated from specific materials or a special technique; for example, using ground glass or glitter to embellish a painting, using stencils, or collage using maps or unique papers. I use these materials to generate ideas of how I could incorporate them within my artwork, using my signature style. I have a new series of paintings that use resin in unique ways. As I begin to create, I typically paint a solid color on the entire canvas, and then place lines of tape, to be uncovered later. Many of my paintings all use a similar color palette of primary colors, white, black, and neutral greys. My work focuses on lines, shapes, vibrant colors, and the integration of an illusion of mosaic tile. I’m inspired to create visual parallels of my world impressions using these techniques. This illusion of mosaic tile provides cohesion to my body of work and serves to provide balance, repetition, movement, and other elements of strong artistic design and composition. 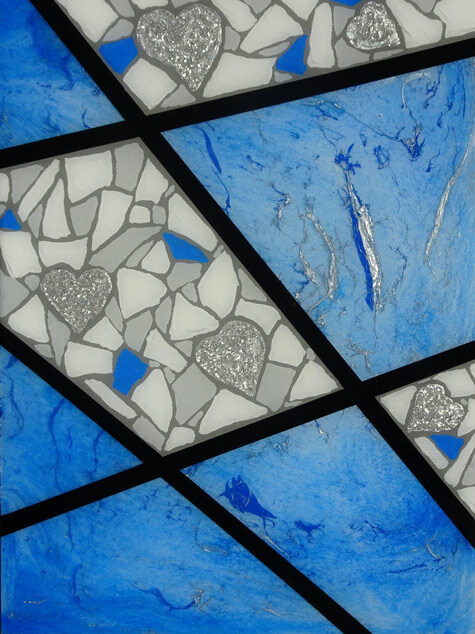 I often think about the mosaic element as confetti, to further my goal of conveying fun, exhilaration, and happiness; the mosaic patterns add life and positive energy into my artwork.